Lime Tree is in a convenient, edge of town location that makes a very good base for touring the Peak District. 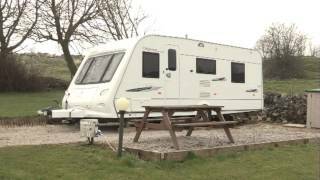 The site has three widely spaced main areas, touring pitches on two levels with a toilet block on the upper level, a caravan holiday home area which has the reception shop and games room, and above and a short distance away a large, mainly sloping field for tents. 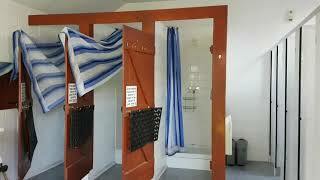 The toilet block for the tents and a play area are above reception. The 25 touring pitches are all on hardstandings with 16A electricity supply. There are 40 seasonal pitches. With good views, the park is situated next to a thickly wooded limestone gorge, and a magnificent old railway viaduct provides a dramatic backdrop. This is also an excellent dog walk. 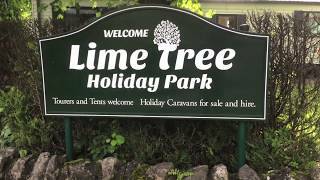 Buxton town centre is a mile or so away and Lime Tree is well placed for exploring the Derbyshire countryside. A modern toilet building serves the caravan and motorhome area, including some washbasins in cubicles, controllable showers, a baby room with the very latest design of baby bath, and a family room with facilities for disabled visitors. The refitted, original unit serves the tent area. Both are heated and have top quality fittings. Laundry room with washing machine and dryer. Shop. Play area. Games/TV room. WiFi area (free). 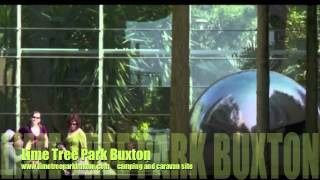 Park is on outskirts of Buxton and is signed from A515 Buxton-Ashbourne road 1 mile south of town. From town, immediately after hospital bear sharp left into Dukes Drive, go under railway viaduct and site is on right. From south watch out for sharp turn right at foot of hill (signed in advance).